Many real estate investment trusts are trading at record highs, but these three long-term winners have lagged behind. Real estate investment trusts, or REITs, have been a bright spot in the market so far in 2016. Popular REITs like Realty Income and Digital Realty Trust are trading at all-time highs and have gained 10.7% and 7.5%, respectively, since New Year's Day. However, not all REITs have performed so well. Welltower (NYSE:WELL), Equity Residential (NYSE:EQR), and Simon Property Group (NYSE:SPG) have all dropped in recent weeks along with the overall market, which creates a good opportunity to get into these long-term winners at a discount. Welltower specializes in healthcare real estate, particularly senior housing, post-acute care, and long-term care facilities. The company has been around and thriving since 1970, and things could get even better. First of all, the market for healthcare real estate is an attractive one. Not only is it highly fragmented -- no REIT has more than Welltower's 2.5% market share -- but it's growing quickly, especially for Welltower's property types. The 85-and-up age group is expected to triple by 2050, which will create more demand for all medical facilities, particularly senior housing and long-term care. Additionally, healthcare expenses are rising for everyone, not just seniors. Over the 10-year period from 2014 to 2024, the percentage of GDP spent on healthcare is forecast to increase from 17.7% to 19.6%. Commercial properties derive most of their value from their ability to generate income, which for REIT investors means not only more money available for dividends but higher intrinsic value of the stock as well. Finally, Welltower has a rock-solid balance sheet and an excellent investment strategy. Most of its investments are made in partnership with some of the most respected operators in the business, and its properties are generally superior to those of its peers. For example, Welltower's average senior housing property is six years newer and located in an area where the median household income is 45% higher than the industry average. Equity Residential owns 390 apartment properties consisting of more than 104,000 units in high-growth and high-barrier-to-entry markets. Rent has been rising quickly across the U.S. thanks to lower unemployment, low vacancy rates, and the demand created by the historically low homeownership rate. However, Equity Residential has an edge over its competition. Equity's core markets are Boston, New York City, Washington, D.C., Seattle, San Francisco, and Southern California -- all of which are high-rent and high-income areas, with strong rental demographics. Millennials are forming new households at the rate of 1 million per year, and 60-70% of them are choosing to rent. The younger generation is attracted to the urban lifestyle, and is choosing to marry and have children much later than previous generations -- both of which are conducive to renting. In addition, buying a home in these markets is expensive. The "cheapest" of Equity's core markets (Seattle) has a median home price that's about 70% greater than the U.S. average. In fact, demand for rental housing in Equity's core markets is expected to grow by 7% in 2016, while supply is only forecast to grow by 5%. In these markets, rent growth and job growth is projected to be higher than the national average, while vacancy rates are expected to remain low, creating an excellent supply demand dynamic. Many investors avoid retail – after all, there have been some pretty high-profile retail bankruptcies in recent years, and many others are struggling to stay afloat. However, Simon Property Group is one retail investment that's definitely worth considering. Simon invests in shopping malls, primarily under its "Premium Outlets" and "The Mills" brand names. The company currently owns nearly 230 properties with 188.6 million rentable square feet. In fact, Simon Property Group is the largest public REIT of any type, and has a rock-solid balance sheet and an A/A2 credit rating – among the best in the business. There are a few other reasons to like Simon for the long-term. First, the company's revenue stream is extremely diverse. Its malls are occupied by about 3,100 individual tenants, and only three of these account for more than 2% of the company's rental income. In other words, even if a few retailers end up victims of online competition and close their doors, it won't affect Simon's bottom line much. Second, and more importantly, Simon does an excellent job of adapting to consumers' changing tastes. Their properties have modern amenities such as Wi-Fi, phone charging stations, valet parking, and shuttle services. Plus, the company is actively adding businesses to its properties that consumers want, such as more sit-down and fast-casual dining options. Many of Simon's properties also feature health clubs and high-end grocery stores. In other words, these are businesses that people need to physically go to -- an excellent way to get people to keep going to the mall in the era of e-commerce. 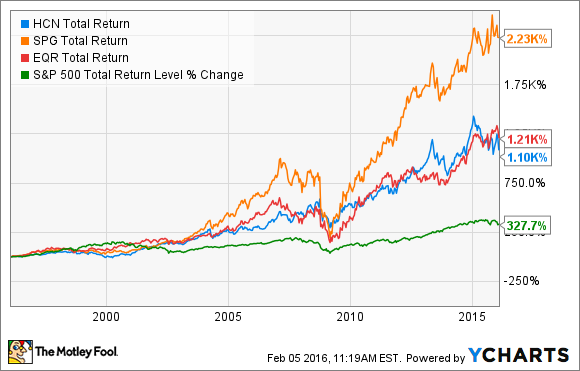 As you can see from the chart below, all three of these REITs have produced excellent performance over the years, and have all handily beat the S&P 500's total return. I know that I mentioned how these three REITs have fallen considerably over the past month, but my point here is that short-term dips like this should be a secondary concern to long-term fundamentals. 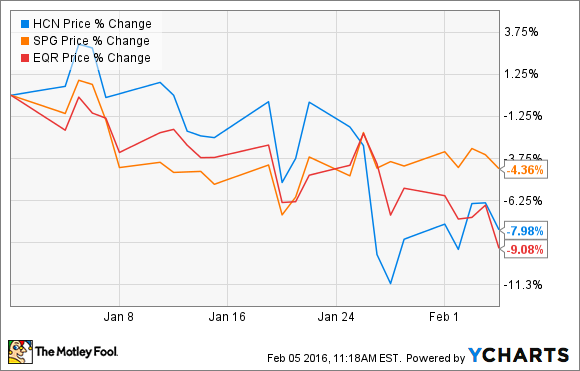 Could these REITs fall even further? Of course, they could -- I'm not attempting to call the bottom in these stocks. However, over the long term, these companies have proven that their business models work and I see no reason to believe they won't continue to deliver market-beating performance in the coming years and decades.